Cockatoo Island is Sydney Harbour’s forgotten day trip. So to help you un-forget, Lee Grewal from the blog Adventure in Our Tea Cups, has compiled her list of things to do today, plus a few historical tales that you may be glad you weren’t around for. As the Cockatoo Island ferry takes you beneath the iron curves and you bend back to see the sky, the steel grey belly slats of the Harbour Bridge look like an abstract work of art. The Opera House and corporate skyline shrink from view and the rounded edges of waterside backyards and jetties appear. It’s a short but scenic ferry ride to the harbour’s largest and most industrious island, but it’s the gateway to several vibrant chapters in Sydney’s history. Uncovering Cockatoo Island’s past and present (photo: Bhanu Uttam). You’ll need to grab a coffee before your afternoon of fascinating island surprises. Or perhaps a freshly made pizza and a cool drink, right on the water’s edge, at Marina Café & Bar. You’ll love Ironlak Bus (a artfully decorated old Sydney bus) and the grassy seating area. Societe Overboard offers a solid breakfast and lunchtime selection (day only), a restful respite from sightseeing just when you need it. There are dozens of army green tents permanently pitched for those wanting to try island glamping at Sydney’s only permanent truly harbour-side glamping site. The tents are positioned perfectly for idling away the night in the centre of the harbour, watching the ferry lights flicker on, and the sun go down. It’s camping in the sense that you’ll be cooking your own meals at the communal camp kitchen (bring your own or pre-order a BBQ & Breakfast pack from Societe Overboard, at least 48 hours in advance). The glamping elements include comfy beds, access to hot showers, fridges, microwaves, with toiletries by Appelles. And, of course, you get to sleep under the stars while hearing the harbour waters lap against the shores. If glamping’s a sleep too far for you, there are solid-wall options on the island too, from Harbourview Apartments to a Fire Station Station studio. Rates for glamping are $120/$155 per night (weeknight/weekend). Ask for a waterfront view. The view from Cockatoo (Island) wan’t always this colourful (photo: Bhanu Uttam). Join a group tour for an hour to discover the heritage of the island and uncover from the top layers through to beneath the surface of this fascinating chapter in Sydney’s convict and early settlement history. On overview of the wonderful tales hidden in time are revealed on On Demand history tours ($16, $12 for seniors) or the more specific Convict History Guided Tour (book ahead). For the curious and brave, there are evening ghost tours full of spooky stories (Haunted History Night tours). Today, Cockatoo has its own social calendar full of crowd-pleasing art, music and cultural events (see CockatooIsland.gov.au), the highlight of which is on New Year’s Eve. You’d be hard pressed to find a better spot beneath the canopy of a night sky bursting with sound and light show that is Sydney’s fireworks spectacular (obviously, book ahead to secure accommodation and check prices). The industrial side of Cockatoo Island has a certain historical charm about it – and the views ain’t bad either (photo: Bhanu Uttam). 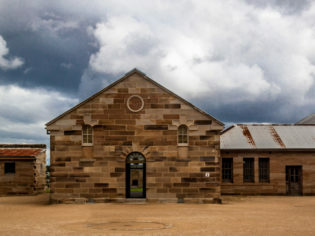 Cockatoo Island is often seen as a Sunday picnic getaway, but beneath its surface are stories of wartime victories, convict hardships and lost children. Here are the tales that weave the island’s history. Before 1788, the island was called Waremah by the Eora, the coastal indigenous tribe who would have enjoyed Sydney’s settler-free rich waterways and eco diversity. The once red-gum forested island was possibly a fishing base for the Eora. Today, this spot looks out across the affluent neighborhood of Hunter’s Hill, with its illustrious homes spilling from the green parklands and pristine white yachts bobbing away in the harbour, but a century ago it would have been a forlorn sight. Amidst its familiar reputation as a shipyard for freight, battle and cargo vessels, Cockatoo was also, sadly, a home to a reform school for girls. Biloela, an indigenous word for black cockatoo, was a mildly educational institution that functioned as both an orphanage and reform facility for girls charged with petty crimes. At the turn of the century, with the onset of the industrial revolution and gold rush, these institutions popped up across the globe in response to more families working and a rise in children’s petty crimes. 4. Where are all the cockatoos? Why ‘Cockatoo’ Island? The British apparently gave the island the name after seeing gregarious flocks of Sulphur-crested cockatoos that were attracted to the rich native flora of the island including the once prolific (on the island) Sydney red gum. The most famous legend about Cockatoo Island is a story of the one that got away. Captain Thunderbolt (A.K.A. Frederick Ward) escaped captivity on the Island in the mid-1860s, only to return to his bushranger ways; riding and pillaging across New South Wales. His escape route was a quick swim across the harbour to Woolwich with another inmate, so the unverified story goes. Access to the Cockatoo Island is by ferry, which takes half an hour from Wharf 5 at Circular Quay (every 30 minutes). The island’s Visitor Centre is open from 10am to 4pm every day. MORE… Follow Lee Grewal and travel partner (photographer Bhanu Uttam) on their blog, Adventure in Our Teacups – the story of “two gals, one world, a million adventures”. This seems like a very interesting island to visit. I love the rich history behind it as well as the somewhat scary stories about it which will add to the thrilling adventure. Will definitely check this out after our trip to WA.